Politico has pieced together a fascinating read of the palace intrigue surrounding Nancy Pelosi’s successful battle to reclaim her role as House Speaker. 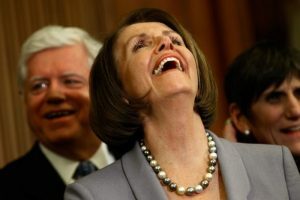 U.S. Rep. Ed Perlmutter, it turns out, was totally out of his league in trying to defeat her, and instead caved to a weak deal Pelosi herself maneuvered. Perlmutter was under siege from Pelosi’s supporters on and off Capitol Hill, and Pelosi was the one who offered term limits as a way for rebel Democrats to save face, while giving her enough votes to drown out the minority Republicans in the January House election. The deal Pelosi offered, she will only serve four years as speaker, voluntarily term-limiting herself. No, the Democratic caucus won’t actually vote to make the term limit official, Pelosi gave her word. That means she will be 82 years old when she steps down, having served 35 years in Congress. Perlmutter jumped at the chance to wriggle out of the jam, and persuaded enough rebels to give Pelosi the 218 votes she needs to become speaker. What the article doesn’t explain, which we looked up for PeakNation™, is that a lawmaker’s pension is based on the number of years in service, and the annuity amount is based on the highest three years of a member’s salary. The House Speaker makes a lot more money than a mere congress critter — $223,500 compared to $174,000 a year. By promising to only serve two terms — four years — Pelosi will retire at the top of the financial chain. So, not only did Perlmutter break his pledge to vote against her, he actually ensured taxpayers will pay a bundle for her years of service as Speaker when she finally retires.